Here are some of the fun polymer clay creations that my classes made a couple of weeks ago. I printed off some cute ideas that I found on Pinterest and let the kids decide what they wanted to make. You can see there was a lot of variety! The robots are some of my favorites. I made the wire coils for the arms, legs & necks with floral wire that I wrapped around a piece of clothing hanger wire. It worked great, and the coils were much stronger than I thought they would be (since the floral wire is so thin). 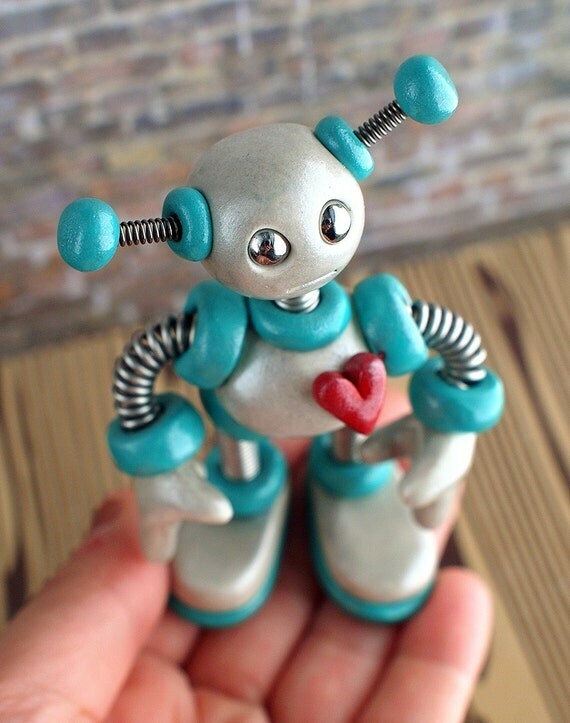 You can check out the gorgeous clay creations of HerArtSheLoves that inspired our robots below. Some of those look my robots!?! The cat and such. :) You found my work on Pinterest? Aww. I blush! You rock, thanks.